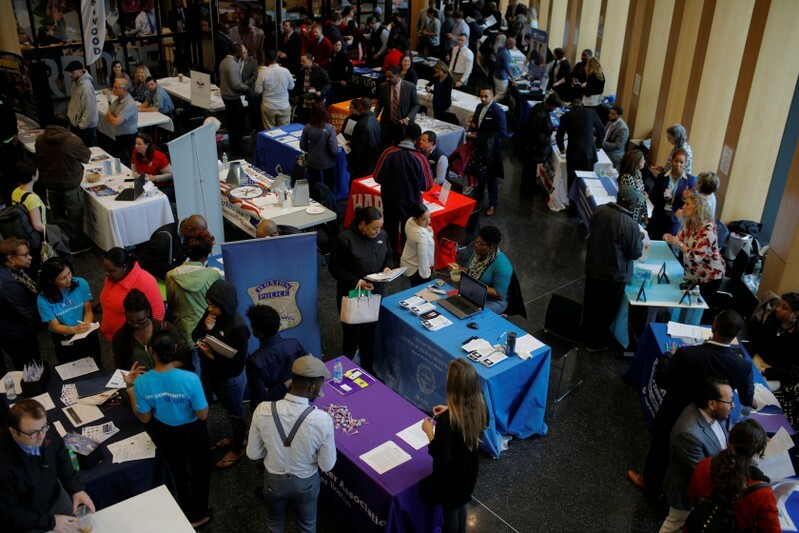 WASHINGTON, (Reuters) – The number of Americans filing applications for unemployment benefits fell to more than a 49-1/2-year low last week, pointing to sustained strength in the economy. The four-week moving average of initial claims, considered a better measure of labor market trends as it irons out week-to-week volatility, fell 6,000 to 201,250 last week, the lowest reading since November 1969. The claims data covered the survey week for the nonfarm payrolls portion of April’s employment report. The four-week average of claims decreased by 19,250 between the March and April survey weeks. This suggests solid employment growth after payrolls increased by 196,000 jobs in March. Though the trend in hiring has slowed, job gains remain above the roughly 100,000 needed per month to keep up with growth in the working-age population. The unemployment rate is at 3.8 percent, near the 3.7 percent Federal Reserve officials project it will be by the end of the year. Thursday’s claims report showed the number of people receiving benefits after an initial week of aid declined 63,000 to 1.65 million for the week ended April 6. The four-week moving average of the so-called continuing claims dropped 22,750 to 1.71 million. COLOGNO MONZESE, Italy (Reuters) – Italy’s Mediaset will make a decision on a possible pan-European free-to-air television alliance by the time of a July 25 board meeting, its chief executive said on Thursday. The board meeting had already been scheduled to review the broadcaster’s decision not to pay a dividend for 2018. The broadcaster, owned by former Prime Minister Silvio Berlusconi’s holding company Fininvest, has in recent months repeatedly raised the idea of creating a pan-European TV player to fend off competition from established rivals and new entrants. 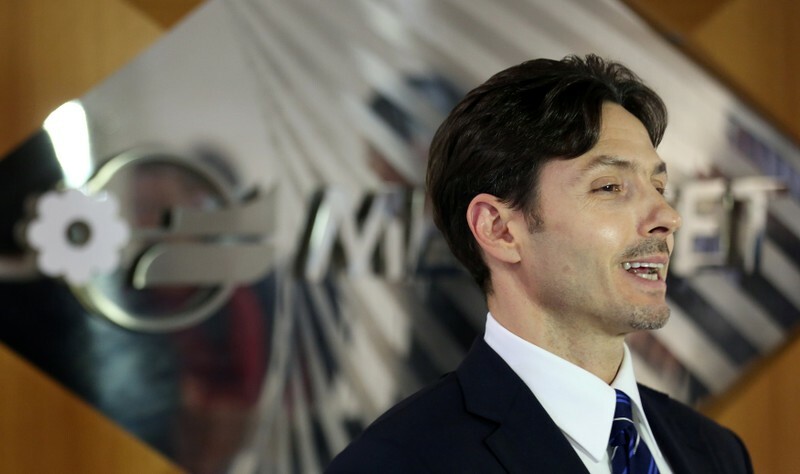 Speaking to reporters after the group’s annual general meeting, CEO Pier Silvio Berlusconi, who is the son of the former premier, said there were several options for Mediaset’s pan-European project. “Once we have all the elements, we’ll understand how to go about this,” he said. Most recently, speculation has intensified that Mediaset and German rival ProSiebenSat.1 Media could strike a deal, but the two companies denied last Saturday a press report that they were in merger talks. Mediaset’s Chief Financial Officer Marco Giordani told the shareholder meeting there were currently no plans to expand in Germany with ProSiebenSat. France’s largest private TV broadcaster, TF1 has also been mentioned in the press as a possible partner for Mediaset, though the company said last September it was not discussing a major cross-border deal with its Italian rival. Thursday’s shareholder meeting approved a loyalty share scheme that rewards longer-term investors with additional votes under an Italian law that is traditionally used by controlling shareholders to strengthen their grip on companies. Fininvest currently owns 44 percent of Mediaset. Under the new scheme, investors will have two voting rights for each share held for at least 24 straight months. Mediaset has been embroiled in a legal battle with hostile shareholder Vivendi, the French media conglomerate controlled by billionaire Vincent Bollore, since 2016 when Vivendi pulled out of a deal to buy Mediaset’s pay-TV unit. As Mediaset considers Vivendi’s stake illegitimate, its board rejected requests from both the French group and the trust in which it has transferred most of its stake to vote at Thursday’s shareholder meeting. Vivendi said in a statement that it could challenge the validity of the decisions approved by the meeting. If a meeting does take place, it would happen before a summit of Japanese Prime Minister Shinzo Abe and U.S. President Donald Trump, Motegi added. Motegi and Lighthizer are negotiating for a trade pact the U.S. government hopes will lower its trade deficit. (Reuters) – European shares were little changed on Thursday as strong quarterly results from Unilever and Nestle tempered data showing euro zone businesses unexpectedly slowed this month. 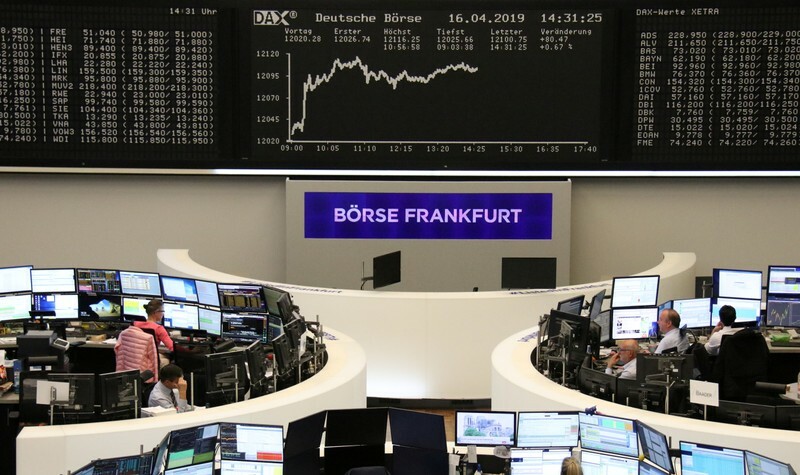 The pan-European STOXX 600 index rose 0.01 percent by 0940 GMT, retreating from an eight-month high and set to snap a six-day winning streak ahead of the Easter holiday. Losses in bank-heavy Milan and Madrid indexes led declines, while Germany’s DAX edged higher. The yield on the German 10-year bund fell further after flash Purchasing Managers’ Index (PMI) data unexpectedly fell to 51.3, a downturn led again by the bloc’s manufacturing industry. “We … have confirmation that we are in a bit of a weak spot in Europe, if you look at the services sector and the composite PMI, and this is the reason why you’re seeing stock markets in Europe soften,” said Ken Odeluga, market analyst at CityIndex. “But I think the PMI data is the wrong data at the right time. We are coming to the end of a very short week,” Odeluga added. Also due are retail sales data and flash PMIs from the United States. Bank stocks fell 0.7 percent, their steepest loss in three weeks. Shares in Osram were among the biggest percentage losers on the STOXX 600 after a German magazine reported that private equity groups Bain and Carlyle were losing confidence in their bid for the lighting group. Kering dropped 3.6 percent and weighed heavily on France’s CAC 40 after signs of a slowdown at the French fashion company’s Gucci brand, particularly in the United States. Top gainer in Germany’s DAX was Deutsche Post, after the Federal Network Agency cleared the way for the postal company to significantly increase the cost of sending letters after the company pledged to hire an extra 5,000 delivery workers. Not all earnings were disappointing. The food and beverage sector raked in a 1 percent rise, the most among European sectors, lifted by upbeat earnings from Nestle. The food group’s shares advanced after it maintained its full-year forecast after good momentum in the United States and China. London and Amsterdam-listed shares of Unilever topped the STOXX 600 after the consumer goods group reported stronger than expected quarterly underlying sales growth, helped by increased prices and volume. Schneider Electric rose after the French company beat first-quarter revenue estimates. Lab equipment maker Sartorius Stedim Biotech rose 3 percent after it maintained full-year guidance as first-quarter revenue rose. French vouchers and card provider Edenred gained 2.3 percent after keeping its outlook for 2019 unchanged. Rival Sodexo was up 0.5 percent. LONDON (Reuters) – Britain’s lenders are starting to put the most costly consumer scandal to hit the industry behind it, with payouts for mis-sold payment protection insurance (PPI) falling in the second half of 2018 ahead of an August deadline for claims. Firms paid 1.99 billion pounds ($2.59 billion) in compensation to customers for mis-sold PPI over the period, down 14 percent on the first half of the year and 3 percent lower than the same period in 2017. The number of complaints about PPI also fell, down 8 percent on the first half to 1.72 million, according to the latest figures from watchdog the Financial Conduct Authority published on Thursday. This helped pull down the overall number of complaints against financial firms by 5 percent. The slowdown in PPI complaints will come as a relief for banks, including RBS and Lloyds, which have already paid out more than 30 billion pounds in redress to customers since 2007. PPI policies were meant to protect borrowers in the event of sickness or unemployment but were often sold to those who would have been ineligible to claim. PPI claims had previously surged following an FCA advertising campaign launched in August 2017 featuring the animatronic head of actor Arnold Schwarzenegger, ahead of this August’s deadline. Despite the fall, PPI remained the most complained about product, accounting for 40 percent of all complaints. Complaints about current accounts also fell 13 percent, after a jump in the first half in part caused by a major IT failure at challenger bank TSB, a subsidiary of Spain’s Sabadell. Complaints about credit cards, the third most complained about product, bucked the trend rising 10 percent. 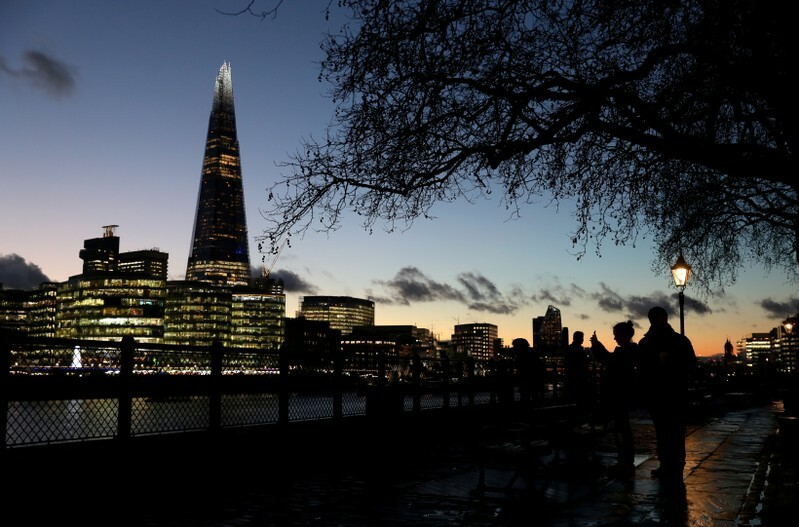 LONDON (Reuters) – Britain has long been a favored playground for sovereign wealth funds from around the world to snap up glitzy skyscrapers, banking stakes and posh department stores. However, uncertainty over Britain’s tortuous exit from the European Union has put many new investments on ice, say sources close to the funds. Last year, there was a sharp drop in investments by wealth funds via private equity, with deals falling more than two-thirds from 2017 to $3.82 billion, according to PitchBook, a data and research firm. “A lot of funds are simply not pursuing deals (due to Brexit), while they wait for certainty,” said Tihir Sarkar, London-based partner at Cleary Gottlieb, which counts several prominent sovereign funds as clients. Brexit has now been postponed until Oct 31 so parliament can agree terms. While that prevents Britain from crashing out without a transition period in place, it also prolongs political and economic uncertainty. At least Britain managed to draw a vote of confidence in February when Norway’s $1 trillion sovereign wealth fund, the world’s biggest, said it planned to keep increasing UK investments. Most large sovereign funds contacted by Reuters did not respond or declined to provide comment, but several said their commitment to Britain remained unchanged while a couple acknowledged a pause in investments. Abu Dhabi’s Mubadala Investment, which has its largest exposure to UK real estate and financial services and whose unit Masdar owns 20 percent of the London Array offshore wind farm, has not made any changes to its investment strategy or portfolio in anticipation of Brexit, spokesman Brian Lott said. “Our long-term strategy is opportunistic, so we will weigh the investment climate either way,” he said. But sources close to two other funds, who requested anonymity, said they were freezing investments until there was greater clarity on Brexit. British authorities may be getting concerned: two sources close to the sovereign fund industry said several funds had been asked by British officials, including ministers, for assurances they would remain committed to existing investments. PitchBook data shows venture capital deal flow with sovereign fund participation in Britain rose 70 percent last year to $1.28 billion. And the pound’s drop in value against the dollar since June 2016 appeared to have boosted allocations to external fund managers based in London, Sarkar said. Britain still ranks joint-third along with India, for investments by sovereign wealth funds in 2017 and 2018, behind the United States and China, according to a report by Spain’s IE University and ICEX. But it dropped out of the top five country destinations as a percentage of total deal volume in 2018, the report noted. Examples abound of the kind of uncertainties Brexit has created for sovereign funds’ British holdings. China Investment Corp’s 2017 acquisition of European warehouse firm Logicor was one such case, said Javier Capapé, director of sovereign wealth research at IE University. “Most of the warehouses are not in the UK but in the EU, bringing potential issues in the case of a hard Brexit,” he said, noting also risks to businesses such as airports and financial services, where sovereign investors are heavily involved. London’s Heathrow Airport is partly owned by Qatar Investment Authority (QIA) and China Investment Corp, while QIA and Singapore’s Temasek Holdings own stakes in Barclays and Standard Chartered, respectively. Brexit has contributed to hastening a shift away from real estate, traditionally a favored choice for investment in Britain, to technology. “I see a structural shift as with real estate you’re a little bit more exposed if you have a low-growth UK which is the expectation with Brexit scenarios,” said Elliot Hentov, head of policy and research at the official institutions group of State Street Global Advisors. QIA, one of the funds most active in Britain, particularly in real estate, is also diversifying its focus after amassing several London trophy assets, such as The Shard, Savoy and Connaught hotels and the high-end Harrods store. It agreed to buy another hotel, the Grosvenor House, Reuters reported in November. “We’ve seen a decline (in British investment) in the past year or two. Real estate investment is definitely declining,” said a source familiar with QIA’s thinking, adding that it was looking more towards the Americas. 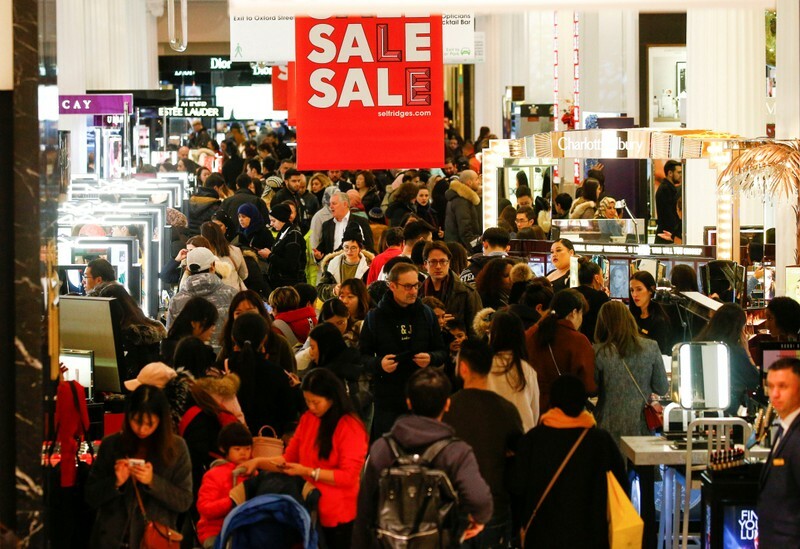 LONDON (Reuters) – British shoppers ignored worries about an impending Brexit deadline and spent heavily in March, official data showed on Thursday, supporting the country’s sluggish economy while companies were cutting back on investment. Retail sales volumes surged by the most in nearly two-and-a-half years in annual terms, leaping by 6.7 percent. That was way above all forecasts in a Reuters poll of economists. The increase in part reflected the slowdown in spending a year ago, when Britain was hit by the so-called Beast from the East snowstorms and icy weather, officials at the Office for National Statistics said. Warm weather in March this year helped increase spending on clothes, the ONS said. Sterling rose on the data, reaching a session high against the euro. Britain was originally due to leave the European Union on March 29, but that deadline was pushed back to April 12 and then again to Oct. 31 as Prime Minister Theresa May failed to break an impasse in parliament on the terms of Brexit. The figures published by the ONS on Thursday covered the period from Feb. 24 to March 30. “There is hope that the delay in a potential no-deal Brexit until October will allow the stronger retail sentiment to remain undiminished,” said Jeremy Thomson-Cook, an economist at WorldFirst, a currency exchange firm. In monthly terms, sales rose for a third month in a row, by 1.1 percent. The median forecast in a Reuters poll was for a decline of 0.3 percent. In the first three months of 2019, a smoother reading of spending patterns, sales grew by 1.6 percent compared with the previous three months, the strongest increase since August 2018. Consumer spending has supported Britain’s sluggish economy through the Brexit crisis, in contrast to businesses, which have cut back on investment. Falling inflation, rising wages and the lowest unemployment since 1975 have boosted household incomes. However, wages after inflation are still below their peak before the financial crisis, raising questions about how long consumers can support the economy, which is struggling not only with Brexit but also with slower global growth. The Bank of England said on Thursday that banks reported they cut back on the availability of consumer credit in early 2019 and expected more tightening in the second quarter. 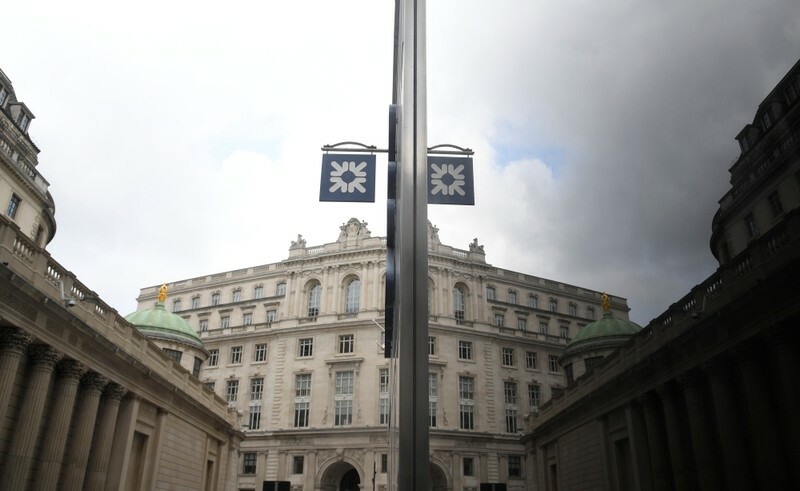 The BoE has predicted the slowest overall growth in Britain’s economy for a decade this year. But BoE officials say they underestimated the resilience of British households in the face of the Brexit referendum in 2016, and Thursday’s figures are likely to further surprise the central bank. The BoE has said it plans to raise interest rates gradually once the uncertainty about Brexit clears. Last week, figures from the British Retail Consortium suggested shoppers had cut spending at high-street retailers for the first time in almost a year in March. But supermarket chain Tesco said its shoppers were not being put off by Brexit. SEOUL (Reuters) – The world’s biggest smartphone maker, Samsung Electronics Co Ltd, on Thursday said it had received “a few” reports of damage to the main display of samples of its upcoming foldable handset. It added that removal of a protective layer on the handset’s display might cause damage and that the company would deliver such information to customers clearly. 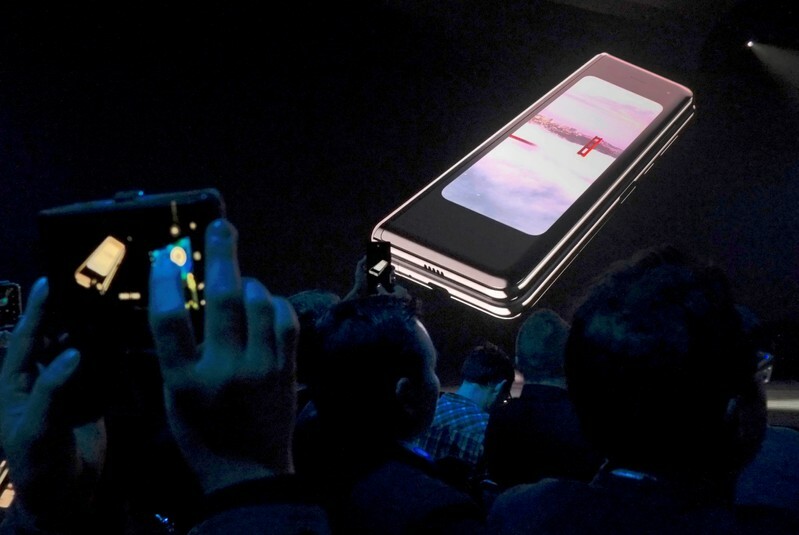 Samsung’s comments followed reviews by some U.S. journalists who reported their Galaxy Fold samples malfunctioned. 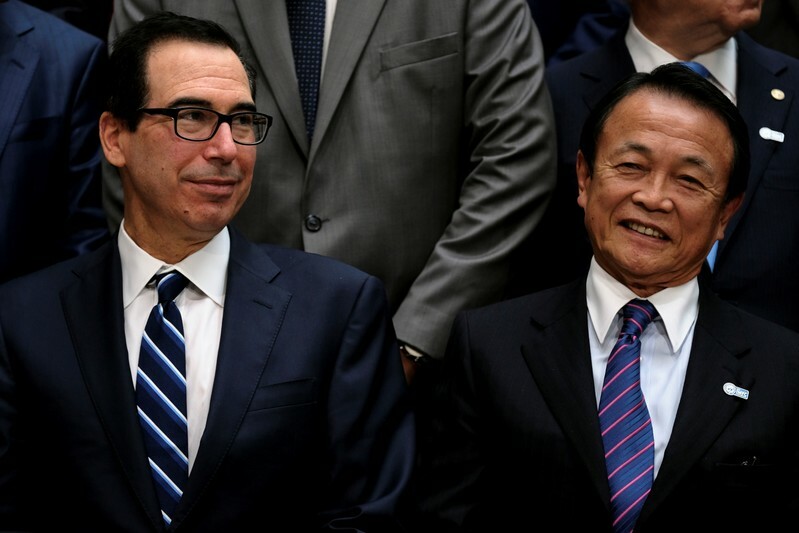 TOKYO (Reuters) – Japanese Finance Minister Taro Aso will travel to the United States on April 25 to meet Treasury Secretary Steven Mnuchin on the sidelines of a summit between Japanese Prime Minister Shinzo Abe and U.S. President Donald Trump, a source said on Thursday. Aso and Mnuchin may discuss provisions against currency manipulation that the United States hopes to include in a trade agreement with Japan, said the source, who has direct knowledge of the matter. Currencies are a sensitive subject for Japan because it has been criticized for keeping the yen weak with monetary easing. Tokyo has long argued that its monetary policy is aimed at generating inflation and not intended to gain an advantage in trade by weakening the yen, but there are lingering concerns this could become a flashpoint in trade talks with the United States. 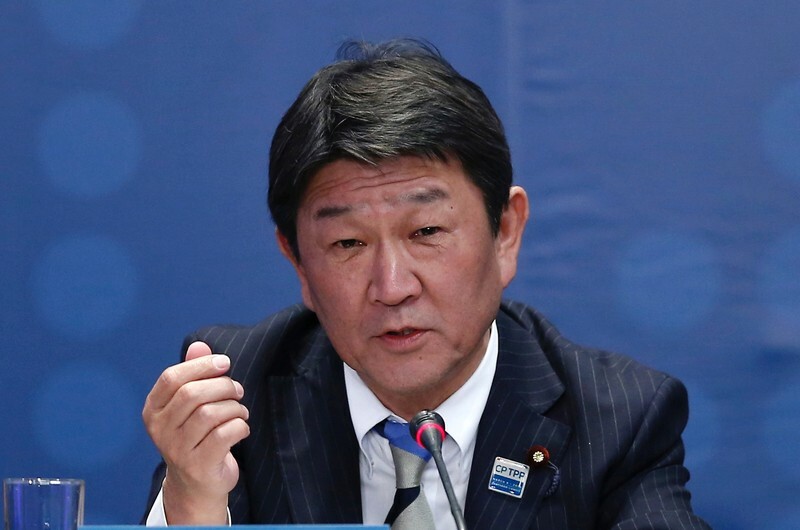 Japanese Economy Minister Toshimitsu Motegi held two days of discussions with U.S. Trade Representative Robert Lighthizer earlier this week toward an agreement the U.S. side hopes will lower its trade deficit. The meeting between Motegi and Lighthizer came after Trump and Abe agreed last September to start trade talks in an arrangement that protects Japanese automakers from further tariffs while negotiations are under way. Trump has made clear he is unhappy with Japan’s trade surplus with the United States – much of it from auto exports – and wants a two-way agreement to address it. During the talks this week, Washington highlighted the “very large trade deficit with Japan – $67.6 billion in goods in 2018,” according to the USTR statement. The United States is also locked in a trade war with China, which has weighed on the global economy as both countries have slapped punitive tariffs on each other’s goods. 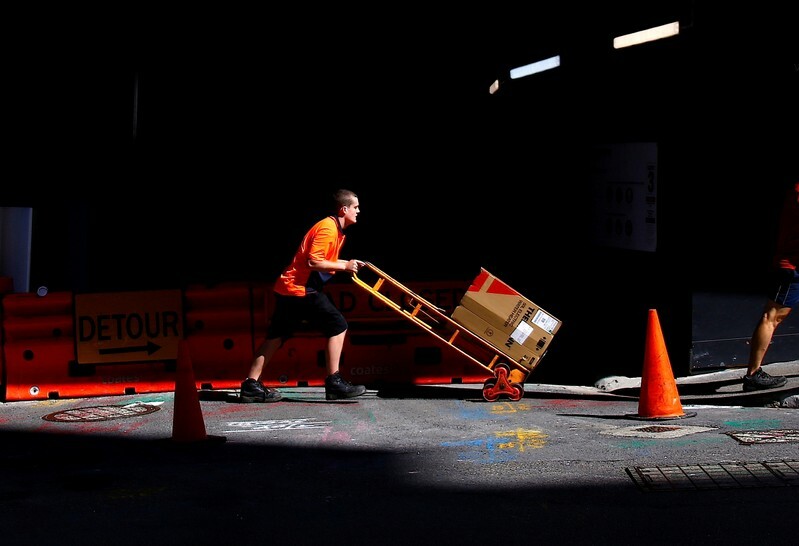 SYDNEY (Reuters) – A bumper run in Australian jobs extended to March and more people went looking for work, official data on Thursday showed, a sign the country’s labor market remains strong despite a small uptick in the unemployment rate. The local dollar jumped about a quarter of U.S. cent to $0.7200 as traders wagered the Reserve Bank of Australia (RBA) will not rush to ease rates even though the broader economy has seemingly lost momentum. The employment report is being closely watched for clues on monetary policy as the country’s central bank is counting on labor market strength for a long-awaited pick up in wage growth and inflation in the face of a property market downturn. Thursday’s data showed a total 25,700 new jobs were created in March, surging past expectations for a rise of 12,000. Encouragingly, all of that increase was led by full-time work with part-time decreasing 22,600. “A solid set of employment figures, dominated by full-time roles, suggests that households and businesses may have to wait a little longer for rate cuts,” said Callam Pickering APAC economist at global job site Indeed. “From the perspective of policymakers, particularly the Reserve Bank, this will be viewed as a positive report,” Pickering said. Australia is creating jobs at a brisk annual pace of 2.4 percent, much faster than the 1.6 percent rise in population. Even so, the unemployment rate rose to 5.0 percent in March from an eight-year trough of 4.9 percent the previous month as the participation rate climbed to 65.7 percent in a sign more people went looking for work. While the jobless rate has stayed in a 4.9-5.1 percent band since last September, consumer prices have remained lukewarm for years now. Worryingly for the RBA, first-quarter data due next week is expected to show core inflation further cooled to 1.7 percent from 1.8 percent in the previous quarter, undershooting its 2-3 percent mid-term target. The RBA has held the cash rate at an all-time low of 1.50 percent for 2-1/2 years now and earlier this year switched away from its long-held tightening bias to a more neutral stance. On Tuesday, minutes of the central bank’s April meeting showed it believes a cut in interest rates would be appropriate if inflation stayed low and unemployment trended high.